Guys… even though I called this recipe a coffee cake, it’s really an any time cake. I know this because after I made it I found myself snagging a small piece of it with coffee, but also before I left the house, when I got back to the house, before I made dinner, after I made dinner, before I went to bed and possibly in the middle of the night. Sooooo… yea. It’s an all-purpose kind of a thing. The bomb part is because I use a classic method of drizzling homemade syrup onto the cake, letting it seep into the pores of it. It doesn’t get soggy though, it just gets infused with slightly bittersweet pomegranate flavors! As the cool kids say (do they? ), this cake really is da bomb. 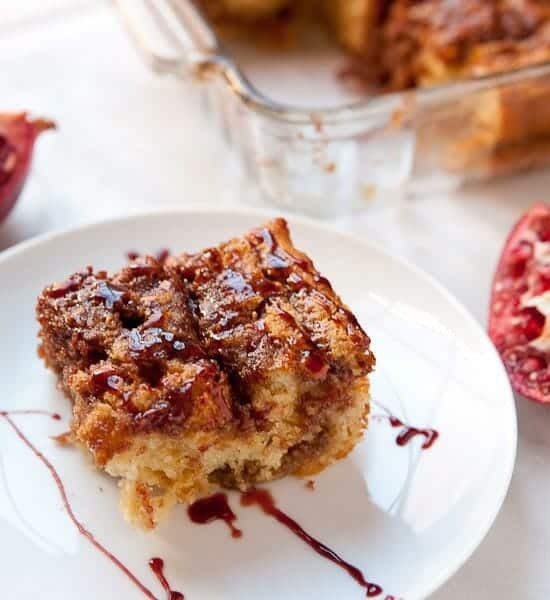 Rich crumbly coffee cake drizzled with a simple pomegranate syrup. I call it the Pom Bomb and it’s a wonderful pomegranate coffee cake! 1) Preheat oven to 350 degrees F. and lightly butter an 8×8 baking dish. 2) Whisk together dry cake ingredients in a bowl and the wet ingredients in a separate bowl. For crumb, mash together ingredients and softened butter with a fork until it resembles pea-sized crumbles. 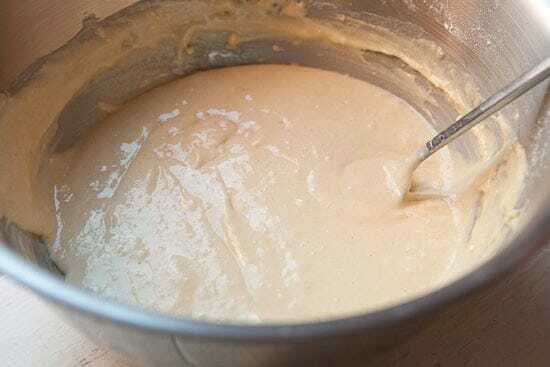 3) Stir wet cake ingredients into dry ingredients and mix until just combined. 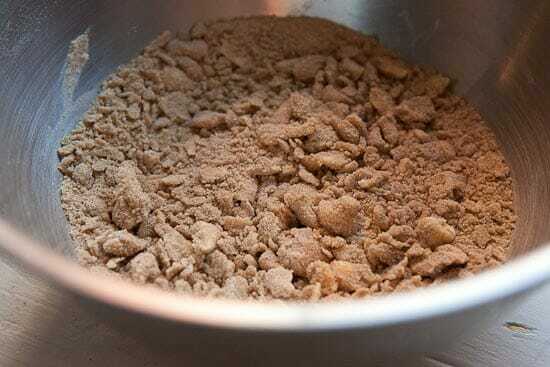 4) Pour half of the cake mixture into your baking dish, top with half of the crumble, then pour over the rest of the batter and top the cake with the remainder of the crumble. Bake coffee cake at 350 degrees F. for 55-60 minutes until crispy on top and cooked through. 5) Remove coffee cake from oven and let cool for 15 minutes. 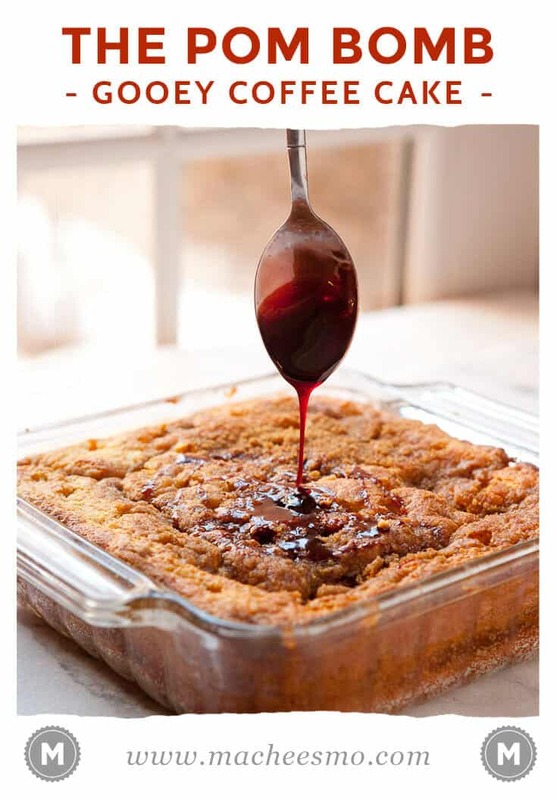 6) While coffee cake bakes, add pomegranate juice and sugar to a medium pot over medium heat. Stir to dissolve sugar and bring to a simmer. Cook until juice reduces by about 2/3 and thickens nicely. Stir it occasionally to avoid burning or scorching. It should take 25 minutes or so to reduce. Once it is about the consistency of maple syrup, it’s done. Remove it from the heat at that point. 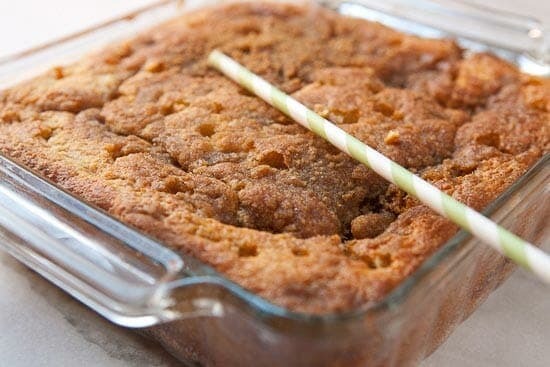 7) When coffee cake has cooled slightly, use a straw or butter knife to poke holes in the cake. Then drizzle on pomegranate syrup. I used about 1/2 of my syrup. You don’t want it too soggy, but use enough to allow the syrup to seep into the cake. 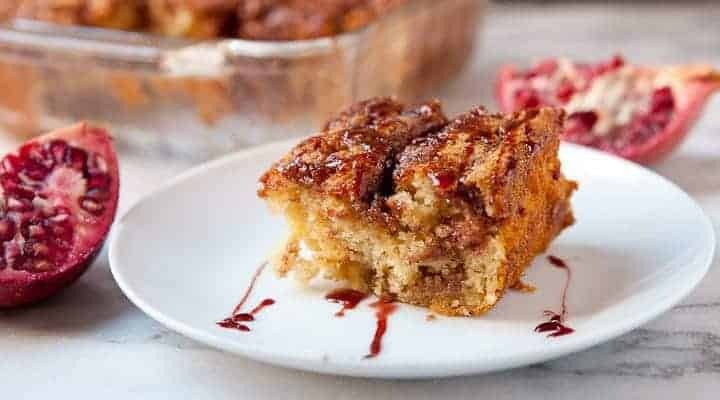 Slice and serve coffee cake while slightly warm (although it is equally good cold) and serve extra syrup with each piece if you want. Store leftover cake in the fridge! A lot of the flavor in this cake comes from the pomegranate syrup, but it’s important not to overlook the actual cake. 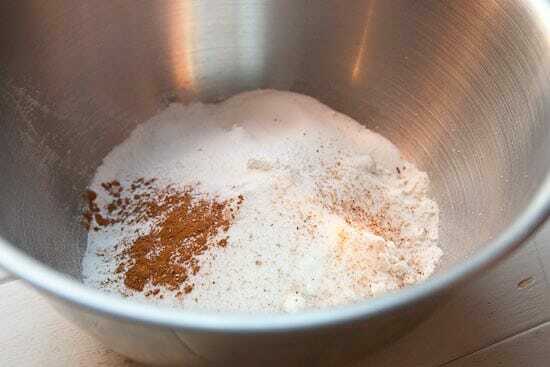 Mix in your dry ingredients well and I like to add a good dose of cinnamon and nutmeg to the dry stuff. Mix the wet ingredients separately (I love greek yogurt in my coffee cake). Then stir the wet stuff into the dry ingredients until the mixture just comes together. There shouldn’t be too many lumps in the finished batter. For the crumb, stir together the ingredients and then mash in the softened butter. It’s not important that it has a uniform texture, but you don’t want any huge pieces of butter. 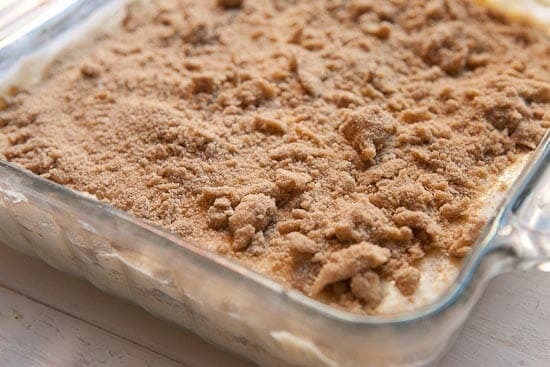 Layer the batter and crumb in an 8×8 baking dish (lightly buttered). Pour in about half of the batter, then half of the crumb, then the rest of the batter. Top the cake with the rest of the crumb and it’s ready to bake! This sucker will need to bake for 55-60 minutes at 350 degrees F. until it’s crackly on top and set in the center. Let the cake cool for 15 minutes or so and then grab a straw or butter knife and poke a bunch of wholes in the cake! This is an important step for the pom bomb later. 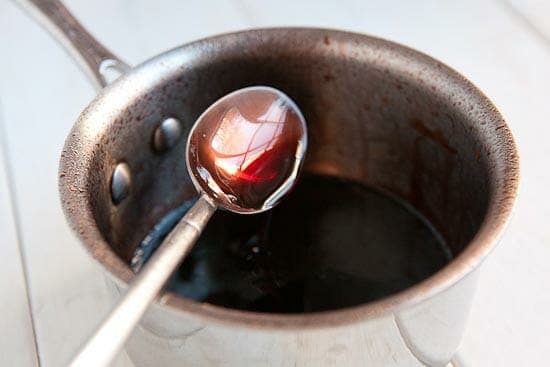 This syrup only has two ingredients but the flavor ends up being pretty complex and totally addictive. The key is to let it simmer over low-medium heat so it doesn’t cook too quickly and scorch. Also, stir the syrup occasionally to make sure the sugar is dissolved in the juice. It will need to simmer for 25-30 minutes probably until it has the consistency of maple syrup. Normally this might be annoying, but your cake takes longer to bake anyway so just make it after you have your cake in the oven. This was my finished syrup, thick and beautiful. After the coffee cake cools, start the drizzle! How much of the syrup you use is up to you, but I would recommend starting with half of it. You don’t want too much or it will get soggy, but use enough so it can seep in nicely. You can serve the cake while it’s warm or it’s also totally delicious at room temperature or even cold. 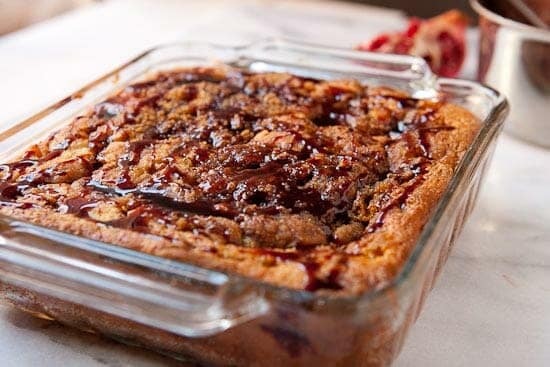 You’ll probably have some leftover syrup which you can drizzle over each piece if you want! Boom goes the coffee cake! What is it about the word coffee cake that made me open this right away? I always think oh good cake that’s not too sweet and no guilt. I like to fool myself. Anyway, I adore one layer cakes like this. Easy, yet so addicting, (right). Oh my. That does look awesome! And the leftover syrup would be good on all sorts of things. Yea… that can happen quickly b/c of the sugar. It can cook too fast quickly… glad it still turned out okay though!